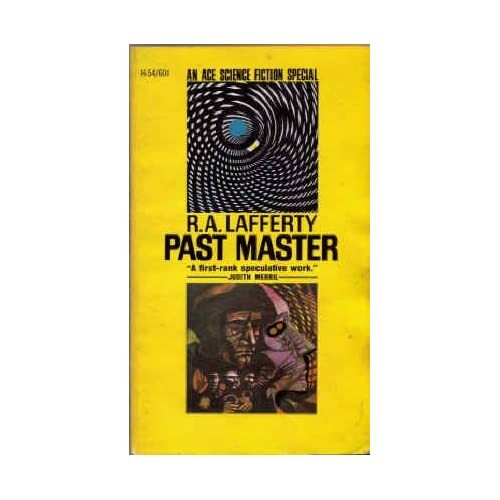 Todd Mason mentioned R. A. Lafferty and his first novel, Past Master, in a comment months ago, but I didn’t forget it. I just moved Past Master higher in the Read Real Soon stack. I read Past Master back in 1968. Rereading Past Master brought back the zaniness of Lafferty’s writing and the impatience I sometimes experience reading Lafferty’s work. A thousand years in the future, an Earth colony called Astrobe, is in severe crisis. Their perfect society is disintegrating. The elite spirit Thomas More (the author of Utopia) from 1535 Old Earth time. More’s time on Astrobe resembles a dream-like series of encounters with witches, hydras, mechanical killers, and bizarre aliens. And that’s always been my problem with Lafferty’s work. In small doses, Lafferty’s wackiness can amuse. But in excess, the extreme surrealism can prove tiresome. The Past Master was nominated for a Nebula and a Hugo, but won neither. If you’re in the mood for something very “different,” check out Past Master. This entry was posted in Uncategorized on March 23, 2012 by george. I read this one sometime in the ’70s in its second printing. I found it an interesting but confusing book. I prefer Lafferty’s short stories, which are often wonderful, to his longer works. Exactly, Bill! Lafferty’s longer works like PAST MASTER and FOURTH MANSIONS tend to exhaust this reader. I prefer Lafferty in small doses. And the reaasons you cite are precisely why I did not get around to finishing PAST MASTER when I thought of doing it as a Forgotten Book. Very good but taxong and I did not have the time. The last third of PAST MASTER was a bit of a slog for me, Scott. As Todd Mason pointed out, PAST MASTER is an important book. It was considered New Wave, but Lafferty’s work is part of no real genre. He and his work was completely unique. Lafferty is one of my favorite all time SF writers, and PAST MASTER is one of my favorite all time SF novels. Or he was (and it was) back in 1968. It made me sit up straight, truly it did. Both he and the novel are like nothing I’ve ever read before, or since. One of a kind, both! On the other hand, I don’t think I’ve read the book since then. I wonder what I’d think of it today. I had the same reaction to PAST MASTER back in 1968, Steve. In 2012, I had a more muted reaction. Rereading has its consequences. I agree that Lafferty was much better in short story form, but PAST MASTER wowed me when it first came out. Later, when I found out that Lafferty was a devout Catholic, parts of the book came together for me. In the early Seventies I saw Lafferty at a Worldcon. In my memory, he was a little gnome of a man sitting alone on one bench or another throughout the weekend. I was too young and too insecure to strike up a conversation with him although it seemed he was hoping that some fan might recognize him and do so. He was a great talent but there was something sad about him that weekend. Great story, Jerry! I was in an elevator at a World SF Convention in Toronto with Isaac Asimov and, like you, I was too shy to speak to the Great Man. Now, I wish I did. The value of the novels lies in part in how they delineate out the full Lafferty world-model and world-view, and the deep mythos which is only ever occultly lurking in the short stories. That might well be, gwern. But the discursive aspects of the novels cause frustration for readers…like me.